Founded in 1946, Knowles offers a growing range of micro-acoustic, electro-mechanical, and related technology platforms to support its customers. Knowles was the first to introduce MEMS microphones to the market in 2003 and is now the world-leader in MEMS microphones, with its SiSonic technology. Knowles is Apple’s main MEMS microphone supplier. Yole Développement estimates the sales of Knowles’ MEMS microphones at $360M in 2016, giving the company over 40% of the market. That year, Knowles shipped over 1.55 billion MEMS microphones. Moreover, Knowles has filed several patent lawsuits in the last ten years against rival manufacturers. In this context, it is important to understand the links between Knowles’ MEMS microphones and their related patents. 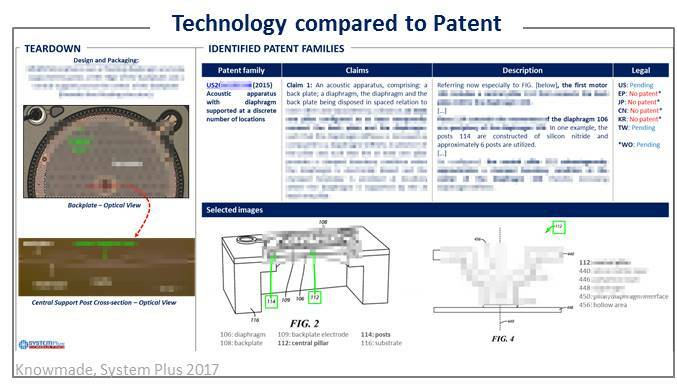 Our partner, System Plus Consulting, analyzed the MEMS microphone components included in the iPhone 7 Plus, which was launched by Apple in September 2016. The smartphone contains four MEMS microphones: one front-facing top microphone, two front-facing bottom microphones and one rear-facing top microphone. Two different MEMS microphones from Knowles have been found in the iPhone 7 Plus, the KSM microphones, KSM1 or KSM2, and the KMM microphone, KMM1. The models are very similar and the study focuses mainly on the KSM format. 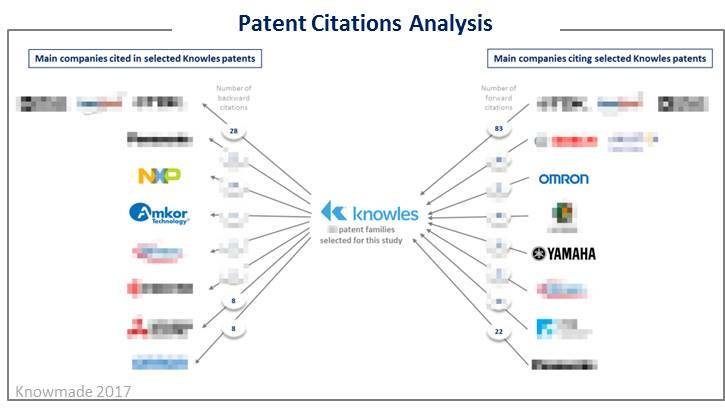 Based on the features revealed by the microphone teardowns, we have identified the closest Knowles patents to these technologies, and describe the main claimed features. This helps understand the core technologies developed by Knowles in their MEMS microphones. 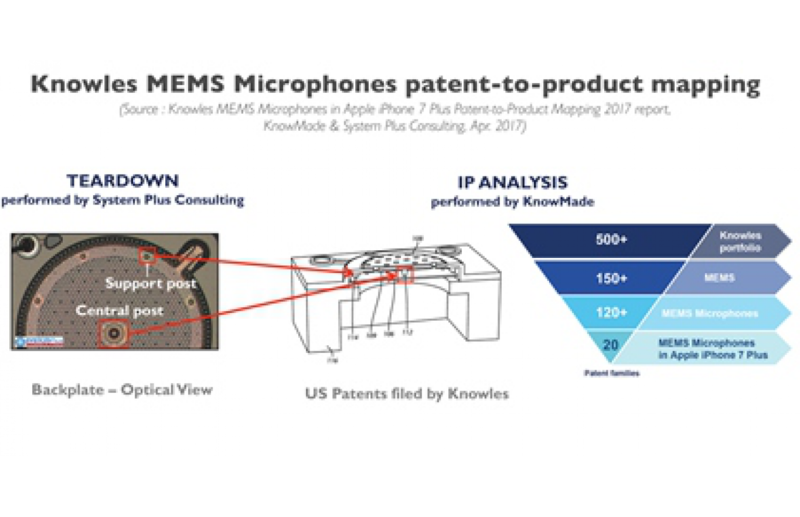 Knowles microphones in the iPhone 7 Plus include technologies claimed in patents published in the early 2000s and in the mid-2010s. We have also observed new IP activity linked to these microphones. The technologies currently being developed could represent a new angle of attack for infringement litigation from Knowles after the wave of suits the company initiated over the last decade.